The end of sprawl is in sight. 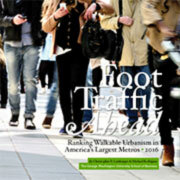 The nation’s largest metropolitan areas are focusing on building walkable urban development. For perhaps the first time in 60 years, walkable urban places (WalkUPs) in all 30 of the largest metros are gaining market share over their drivable sub-urban competition—and showing substantially higher rental premiums. 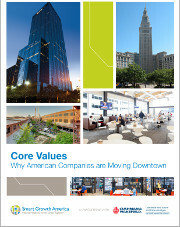 Walkable real estate development projects and places are on the rise nationwide, but certain metro regions are progressing faster than others, according to a new report released today by the Center for Real Estate and Urban Analysis at George Washington University School of Business in conjunction with LOCUS: Responsible Real Estate Developers and Investors, a program of Smart Growth America. The report, Foot Traffic Ahead: Ranking Walkable Urbanism in America’s Largest Metros, ranks the country’s top 30 metropolitan areas based on the amount of commercial development in Walkable Urban Places (WalkUPs). The study finds higher education levels and one-third higher GDP per capita in high-ranking cities. Additionally, a series of forward-looking metrics examine the future development patterns in these metro areas to predict how walkable or how sprawling their future development is likely to be.